Riverness. This can be defined as the feelings that emerge out of the process of connecting with the river. Engaging with nature is aimed at getting out of our heads and into our senses. To feel kinship with all life. To heal. To learn. To experience. To recharge. To gain a fresh perspective. To build and cement special relationships with ecosystems and places. 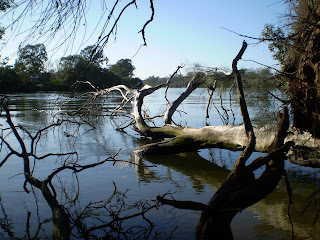 ‘To be engulfed by wildness and mystery and wonder’ (Baetz, 1997:35; see also the blog by RiverRatRanger). David Cumes (1998:79) remarks that there are no words in English to describe this ‘powerful inner effect on the psyche’, particularly in wild places. He terms it ‘wilderness rapture’. Certain ‘power places’ are known for their potential to transform through experiences of self-transcendence known as ‘peak experiences’ (Maslow, 1964). These peak experiences or ‘flow’ experiences (Csikszentmihalyi, 1990) are chactacterized by feelings of being ‘in the moment’, feelings of unity and oneness, of joy, bliss and peace, outside time and space, a sense of the numinous, a change of heart, and a change of being in the world. The marvellous wilderness theorist and garlic farmer Robert Greenway (1995:128) promotes wilderness experience as an important pathway for regeneration. His research shows that 90 percent of participants in his wilderness programs over 25 years experience a heightened ‘sense of aliveness, well-being, and energy’ during the sojourn. The difficulty comes at the end of the experience when they return home and begin to lose that loose and open feeling of connectedness with the natural world. Within two days of arriving home, over half the people said their positive feelings had turned to depression. Greenway refers to this fluctuating feeling as the ‘wilderness effect’. Will you talk with me now? Baetz R, 1997, Wild Communion. Experiencing Peace in Nature, Center City, Minnesota, Hazelden. Csikszentmihalyi M, 1990, Flow. The Psychology of Optimal Experience, New York, Harper & Row. Cumes D, 1998, 'Nature as Medicine: The Healing Power of the Wilderness,' Alternative Therapies, 4, 2, 79-86. Greenway R, 1995, 'The Wilderness Effect and Ecopsychology,' in T Roszak, M E Gomes & A D Kanner, eds, Ecopsychology. Restoring the Earth. Healing the Mind, San Francisco, Sierra Club. Maslow A, 1964, Religions, Values, and Peak Experiences, Columbus, OH, Ohio State University Press.